... in three 10 day increments. Employment precluded just leaving our jobs for the 30 consecutive days we estimated we'd need to get Winterlude to southwest Florida, specifically Burnt Store Marina in Punta Gorda. So we figured three 10 day voyages, leaving the boat in marinas at the end of each segment. That was the beginning of our "commuter cruiser" lifestyle! 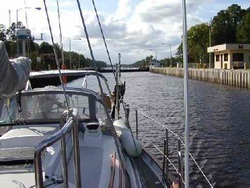 We couldn't leave to go cruising until fall of 2004, so we looked for a marina that we could easily spend 50 nights a year on the boat, learning to cruise and getting the boat ready to leave the country. Southwest Airlines flew from Indianapolis Indiana to Ft Myers Florida for next to nothing ... and Burnt Store Marina's location on Charlotte Harbor meant we could be aboard the boat in less than 3 hours from leaving Indianapolis, and literally sailing an hour after that ... making long weekends easy and lots of fun! 50 nights a year was easy and affordable! Phase I: Annapolis to New Bern, North Carolina ... Winterlude left Annapolis late on Thursday afternoon, September 6, 2001, just to "get away"since we definitely didn't want to start our initial voyage on a Friday. Departing for a major journey on a Friday is bad luck and we didn't need any bad luck! Sailing around Thomas Point Lighthouse to Harness Creek, we anchored for the evening in solitude. It was a very peaceful anchorage and after sundowners David installed our new Glebe Screenworks screens. Friday September 7, 2001 ... We sailed all day down the Chesapeake. It was beautiful sailing albeit directly on the nose -- we were to learn that no matter what direction the wind is predicted, it will ALWAYS be right on our nose! We made only 20 miles good south that day, not good since we had over 400 miles to go! Misjudging how long it would take to get to our anchorage meant our first experience anchoring after dark. Luckily we had been in the anchorage on the way up from Hampton Roads, Virginia to Annapolis. Saturday, September 8, 2001 ... Departing Solomon's at daybreak was a very pretty sight. We were the only sailboat in a long procession of fishing boats. Saturday evening after putting in 61 miles, we enjoyed this beautiful sunset in Godfrey Bay, just across from Fishing Bay. We shared the anchorage with just one other boat - they were probably sorry to see us arrive. We left before they were up the next morning. ... This was the best day yet! We were flying, motorsailing with the genoa out, doing over 7 knots at times! We arrived at Norfolk by 2:30 PM and decided to keep going to try and get through all the bridges and the lock while it was still late Sunday afternoon - we figured it would be less traffic. We were right! There were very few boats at all and we only met 3-4 barges the entire trip! 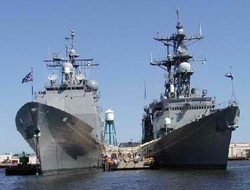 Sunday afternoon's journey through Norfolk was peaceful and enjoyable with all the HUGE Navy ships everywhere. We saw destroyers, battleships and carriers lined up one after another. Little did we know that within 36 hours, they would all be on active alert, the ICW would be closed and all our lives would be changed forever! Locking through the Great Lock and finally docked at the Atlantic Yacht Basin at the end of a 77 mile day, thanks to the great motorsailing we had at the end of the Chesapeake! This was the best day yet -- we were FLYING, motorsailing with the genoa out, doing over 7 knots at times! We arrived at Norfolk by about 2:30 and decided to keep going, to try and get through all the bridges and the lock while it was still late Sunday afternoon -- we figured it would be less traffic. We were right, there were very few boats at all and we only met 3-4 barges the entire trip! Sunday afternoon's journey through Norfolk was peaceful and enjoyable with all the HUGE Navy ships everywhere. We saw destroyers, battleships and carriers lined up one after another. Little did we know that within 36 hours they would all be on active alert and the ICW that we travelled would be closed to civilian traffic! Tuesday, September 11, 2001... Moments before this shot was taken headed down the Alligator River, we passed a Swiss sailboat headed north. The boat called on the VHF to tell us that the World Trade Center had just been blown up -- no details. I immediately got out the GlobalStar satellite phone and got online ... unfortunately all I could get was headlines as the CNN & MSNBC websites were both overwhelmed with traffic slowing down response ... and with a 9600 baud modem, I timed out before I coudl get more than just the headlines ... which were grim enough! It was such an unbelievable experience being in such a tranquil environment and realizing that not far from where we enjoyed almost total solitude, there was such pain and suffering. Tuesday evening we went into River Forest Marina in Belhaven, North Carolina to watch the news and see the horror and destruction for ourselves. Wednesday, September 12, 2001 ... how ironic is it that the sunrise is just as gorgeous as the day before, yet the entire world has been changed. Every day is precious and we must enjoy it to the fullest! Somber, we left River Forest Marina and headed to New Bern, NC to Northwest Creek Marina, arriving early in the afternoon. We spent the rest of the day learning how to prepare the boat for hurricane season to the specs of this marina who's claim to fame is they've never lost a boat to a hurricane! No wonder! 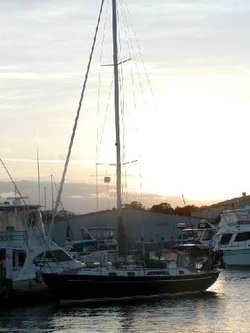 We had never taking all our sails and canvas off or done half the preparation we learned at Northwest Creek Marina! Their regulations would prove very valuable to us in later hurricane season preparation! One of the things we had never counted on was the cruising community! Our flight was scheduled back to Indianapolis on Friday, September 14, 2001... on Midway Airlines, which had immediately declared bankruptcy and shut down operations with the events of September 11. So our flight was cancelled, most of the airports were shut down anyway and we had no way home. At the time it seemed very important to get back to the "office" and back to work. Luckily Brad and Holly, acquaintances via the Cruising World Bulletin Board, looked us up when they heard we were staying at the marina in their neighborhood. We enjoyed margaritas at a great local mexican restaurant we would have never found without them, got a tour of their boat, Pelican, and Holly recommended we call the local Avis office regarding our transportation home. We called, they had one car left, did we want it! YES YES YES!!! Driving home, the American spirit was never so evident -- flags flying and patriotic symbolism everywhere. Phase II ... New Bern, North Carolina to Merritt Island, Florida ... WInterlude has now completed 1,100 miles from Annapolis to Merritt Island, Florida. We've traveled the Chesapeake, the ICW and outside in the Atlantic. We started Phase II of our trip full of high expectations and hopes of getting Winterlude all the way from New Bern, NC to Ft. Myers, FL, but weather consistently denied us the sailing window outside in the Atlantic. 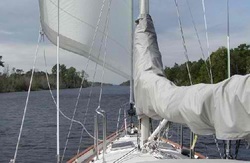 Winterlude motorsailed or motored day after day down the ICW with two noteable exceptions. 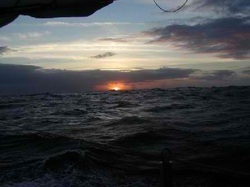 The first, we spent our first overnight passage in the Atlantic. After dark the winds & waves kept building until we were in Force 7 near gale with 10-12 foot seas. We decided to come in Charleston Harbor. The second time we ventured out, only to face continually building winds & seas and prudently came back in the next safe inlet south. Phase II added greatly to our experience levels, and Winterlude is safely in Harbortown Marina in Merritt Island, Florida awaiting our return to continue the last 473 miles to Punta Gorda and Burnt Store Marina! 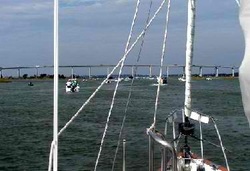 Cape Fear Inlet, Sunday, October 7.... We motorsailed out Cape Fear Inlet on a dying breeze in the late afternoon. It was beginning to appear that the predicted 10-15 knot winds might never appear when they filled in and we were finally able to turn off the diesel and sail for the first time on the trip. As every sailor knows, turning off the diesel is pure heavenly quiet! 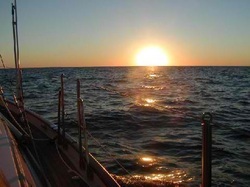 See our first ocean passage sunset! Doesn't show much of the Force 7 conditions that were to follow! Interestingly, weather forecasts called for decreasing wind & waves overnight, but actual conditions were much different! Photos never show the real conditions, but David's face (see below) does -- it was blowing 30 steady with gusts to 35 and waves directly on the stern at 10 - 12 feet high and breaking. It was a somewhat wild ride back into Charleston Harbor the next afternoon! Sunset in the Atlantic the day we ventured out St. Catherine's Inlet in Georgia, before we returned via St. Mary's Inlet at 1 AM! Our first inlet entrance in the dark, not ideal, but necessary under the conditions! 28 knot winds, big seas & a torn mainsail contributed to our desire to get back inside! We saw lots of fishing boats during our ICW trip -- here's a shrimper off the bow. At this bridge, there were literally hundreds of little pleasure boats fishing in a tournament! 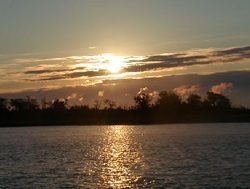 ICW sunsets day after day, too numerous to show all nature's spectacular colors! 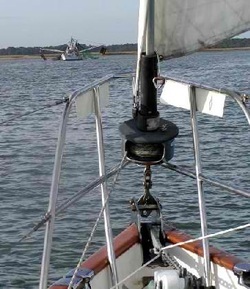 Did we mention blowing out the mainsail coming back in St Mary's Inlet? 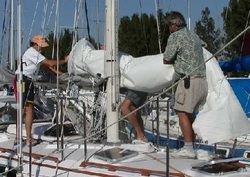 We had Winterlude measured for a new mainsail in Harbortown Marina, Merritt Island, FL. THANKS to Mack Sails for getting our new mainsail - and MACKpack built and back to us in timely manner so we could continue our journey. 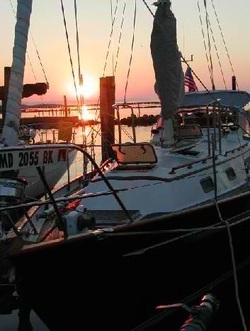 Winterlude is finally safe & sound at Burnt Store Marina after sailing 26 days and almost 1,500 miles from Annapolis. We certainly wouldn't trade the experience for anything, but it wasn't all fun either. Along the way, we had to get the windlass welded, replace the mainsail, add a 95% jib per Bob Perry's recommendation and now we're working on getting whatever is wrong with the transmission fixed. We had some days of motoring along the ICW, a few days of motorsailing the ICW and the Chesapeake and some glorious sailing on the final phase of the trip. David's favorite part was sailing past Port Everglades Inlet right after sunset when the parade of seven cruise ships was departing. 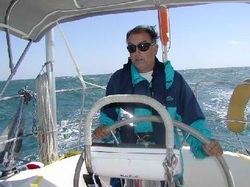 Jan's favorite parts were the day sailing from the Chesapeake into Norfolk & past all the Navy ships down the ICW and the day spent sailing as we left Marathon. Slide show follows ... click on the upper left hand corner of the big photo to start or pause the slide show! ENJOY! Or just click on individual thumbnails if you just want to see that photo & the caption! Postscript: After arriving in Burnt Store, we talked to a bunch of people about the diesel/transmission problem. Literally four different individuals separately recommended Don Bowen from Diesel Connection as the best diesel guy in the area so we had Don take a look at the problem. He has to pull the transmission to be sure, but he thinks it may be a faulty drive plate -- that's the plate between the diesel & the transmission. He also thinks our engine mounts are substandard and allowing the diesel to vibrate too much. This may be good news because it may be that we don't need a transmission rebuild after all! Also, the boat next to ours is having it's teak redone and it looks absolutely gorgeous! So we talked to Jim Worcester who is redoing the teak. I'm pretty sure we'll have him redo our teak over the next few months. For now our immediate adventures on Winterlude are over -- we don't have plans to go back until late January when we're going to try living in the marina, taking advantage of the telephone hookups to work from the boat for a couple of weeks.